Our red-vested Walkway Ambassadors are the welcoming faces you see when you visit the Walkway Over the Hudson State Historic Park. They are the pulse of the Walkway, serving as greeters, tour guides and information providers, and assisting Park staff. Ambassadors volunteers enjoy giving back to the community by sharing their time and knowledge of the region to enhance your visitor experience. 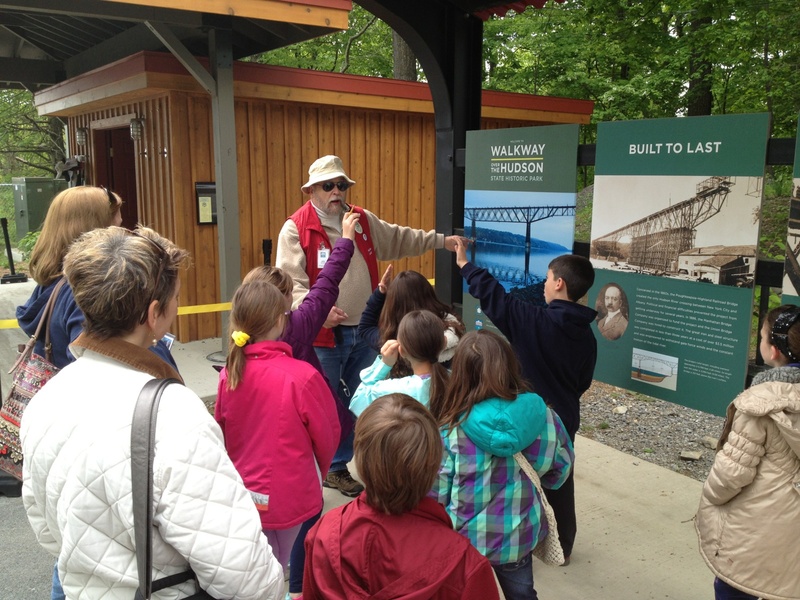 You can join this energized and committed Ambassador Corps, now more than 140 strong, and be a part of Walkway Over the Hudson's outreach to more than 500,000 visitors each year. Walkway Ambassadors come from all walks of life. Whether you are retired, empty-nesting or just seeking to become part of a fun and lively group of people, we encourage you to join us! When you decide to become a volunteer, your initial training will includes two 2-hour classes plus an on-site tour. Additionally, you will receive a mentor and sales training to learn more about how to support our merchandise pavilions. Our volunteer program has been recognized by New York State as a model for other park volunteer programs statewide. Field trips to various parks and historic sites within a 90-mile radius to help volunteers point out to visitors other attractions that are available in the area. In addition to completing the required training, volunteers provide their own transportation and commit to serve at least 50 hours per year, with 16 of those hours working in the merchandise pavilions. What do Walkway Ambassadors do? Provide program and event assistance including, planning, management, logistics, traffic control, etc. We welcome new volunteers who wish to share their unique skills with the Walkway and our visitors! For more information about becoming a Walkway Ambassador contact Theresa Sanchez at 845-454-9649 or email tsanchez@walkway.org. Thank you and see you on the bridge! Interested in Becoming a Walkway Ambassador? Contact Theresa Sanchez at 845-454-9649 or via email at tsanchez@walkway.org for more information.